Want to learn more about this alternative approach to using ThreadLocal? Click here to find out more about using ThreadLocal in the Spring Framework. In this post, I will discuss how to use Spring’s ThreadLocalTargetSource to prevent dealing directly with the dangerous ThreadLocal, while practicing dependency injection and proper mocking in unit tests. Note: This approach would still use a ThreadLocal reference, but it delegates setting, injecting, and clearing it to the Spring framework. This command will create a Maven project in a folder named threadlocaltargetsource-demo with the actuator and web-related Spring Boot dependencies. Read on if you are interested in adding Spring Boot support using the bom approach. 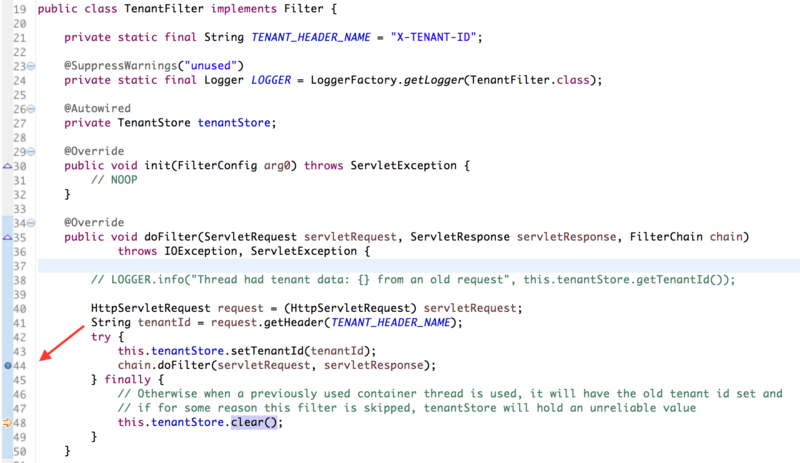 Let’s take a look at the relevant classes included in this demo application: TenantStore.java. This class serves as the tenant data holder. This is where Spring’s beans are instantiated. — tenantFilter() and tenantFilterRegistration() are straightforward. TenantFilter() instantiates a servlet filter, and tenantFilterRegistration() implements a Spring mechanism that allows dependencies to be injected in the TenantFilter.java, a regular servlet filter. Tip: Read this post Implementing and Configuring Servlets, Filters, and Listeners in Spring Boot Applications for more information. threadLocalTenantStore bean: The ThreadLocalTargetSource is useful when you need an object, a TenantStore.java instance in this case, to be created for each incoming request. The target (a TenantStore.java object) will be instantiated only once in each thread and will get removed from each thread’s threadLocals map when ThreadLocalTargetSource’s destroy() is called, for instance when the application is shut down. The tenantStore bean is the target object stored in each thread. It is required to be prototype-scoped in the AbstractPrototypeBasedTargetSource, parent class of the ThreadLocalTargetSource. proxiedThreadLocalTargetSource bean. According to the documentation and source code comments, TargetSources must run in a BeanFactory since they need to call the getBean()method to create a new prototype instance. This class implements a simple API when a TenantStore.java instance is injected. We will see later that there is only one instance of the TenantStore.java class for different requests, each holding different tenant data. This servlet filter takes care of setting the tenant identifier to the TenantStore.java holder and clearing it up during the servlet filter chain’s way out. We will see later how there is only one instance of the TenantStore.java class for different requests, each holding different tenant data. curl -v -H "X-TENANT-ID:tenant_1" "http://localhost:8080/demo"
curl -v -H "X-TENANT-ID:tenant_2" "http://localhost:8080/demo"
Notice that tenantStore's id is 119 and that tenantStore's tenantId is set to tenant_1. As for the second request, tenantStore's id is also 119 but the tenantStore's tenantId is set to tenant_2. Interesting, eh? All of this happens while both requests are still being processed. Also, notice http-nio-8080-exec-1’s stack trace corresponds to the processing request #1. The TenantStore dependency is being mocked using Mockito and injected in the API implementation. A case could be made to prevent using @InjectMocks but that goes out of the scope of this post. This is error-prone since the ThreadLocal would have to be cleared in every test that follows this pattern to prevent a possible misuse if another unit test uses the same ThreadLocal ran in the same thread. And, that’s all! Thanks for reading, and as always, your feedback is very much appreciated. If you found this post helpful and would like to receive updates when content like this gets published, sign up to the newsletter.